In BlockLauncher 1.5.5, scripts can now define custom blocks. Since there is some confusion with the new function calls, I've decided to write up a short tutorial. If you just want the completed mod, https://raw.github.com/zhuowei/ModPEScripts/master/500ise_enchantingbench.js type /enchanttable to get an enchantment table block. If you want to see how it's made, read on! You can specify the texture in three ways. 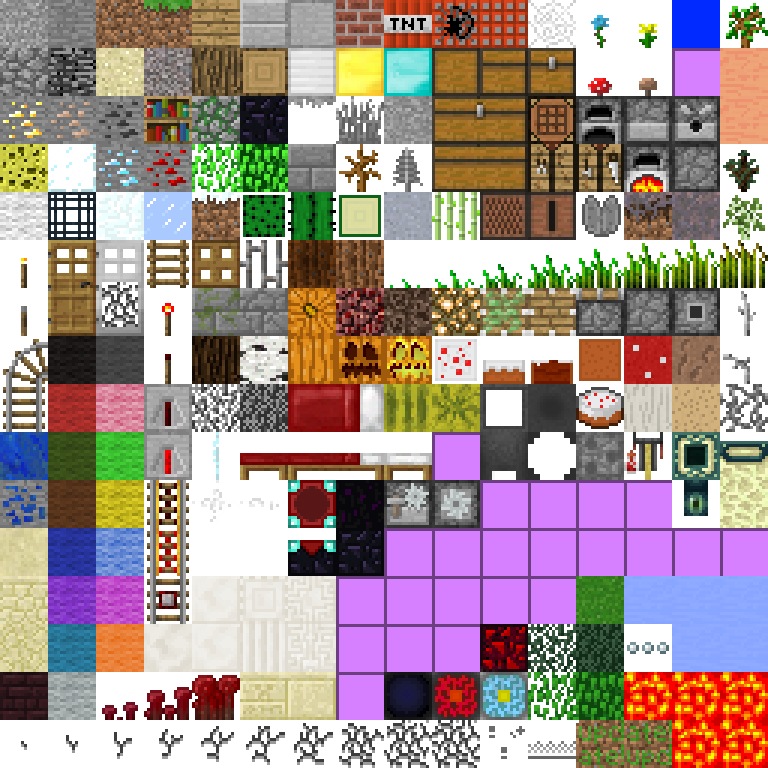 Textures in Minecraft are specified by ID, starting from 0, which is the id on the first row and first column, to 255, on the last row of the last column. Since there are 16 textures per row, this means that, for example, sapling's texture coordinate is 15, and bedrock's is 17. Here's the terrain.png for reference. If your block has the same texture on all sides, just specify the number directly. If your block has different textures on each side, you can specify an array of values for each side, in the order [bottom, top, south, north, west, east]. Blocks, as you might know, have damage values. If you want to specify damage values, simply add more than 6 textures to the array: the first 6 textures will be used for data value 0, the second set of 6 for data value 1, and so on. I highly recommend using damage values: instead of defining, for example, white wool, black wool, and purple wool, use damage value textures and save 2 block IDs. So now we have an enchantment table: let's set the heights of it. For that, we can use Block.setShape. For example, if you want to have a block float off the ground, you can change its minimum y value, and if you want it to be half height, you can change its maximum y value. If you omit the setShape call, you'll just get a regular shaped block. Let's take a look at the shaped block! You'll notice that irregularly shaped blocks are extremely glitchy: if you put a block behind it, some faces won't render. This will be fixed. // in the order (bottom, top, south, north, west, east). // in this case, the side textures are the same, and the top/bottom textures are different. // sets the block's boundaries. // in this case, the block starts at y = 0, and stops at y = 0.75 - this is a block 3/4 m high. In the next part of this tutorial, I'll explain how to let the user interact with custom blocks. Press the green up-arrow if this helped. Now I have to fix my custom blocka modscript ;( oh well, nice tutorial and thanks. First, since we might need to change our block IDs, I decided to move the block ID into a variable. Now, we need to make our enchantment table interactive. First, let's make it breakable. For that, we'll use the Block.setDestroyTime method. to give our block the same strength as a sign. setDestroyTime automatically sets up the explosion resistance value to a sane default, so you probably don't need to call this yourself. Finally, let's make it do something! Since it's just like any other block, the standard ModPE callbacks will work with it. Let's set it up so that it opens a workbench screen when called. To do that, we need to change the block into a workbench when the user clicks on it, and change it back when the user stops using it. We'll define three variables: currentWorkbenchX, currentWorkbenchY, currentWorkbenchZ. Now, we can set the blocks in useItem, and change it back a tick later. In part 3 of the tutorial, some more aspects of custom blocks are showcased, including the ability to recolour textures, and some stupid tricks you can use with custom blocks. But what if you had one carpet texture, and you want to re-colour it for different carpet types? Well, Block.setColor to the rescue! Here's part 3 of the tutorial, where I explain some random stuff that's left over. Block.setColor allows you to re-colour different textures - for example, I used it to re-colour the clay texture for the coloured clay mod. Colours is an array of colour values. the bottom 8 bits specify blue, the next 8 bits specify green, and so on: it's the same as HTML colour codes. If you put more elements in the array, those damage values will get different colours. Some semitransparent blocks needs to render on a different layer to blend - for example, water renders on layer 2, glass renders on layer 1. 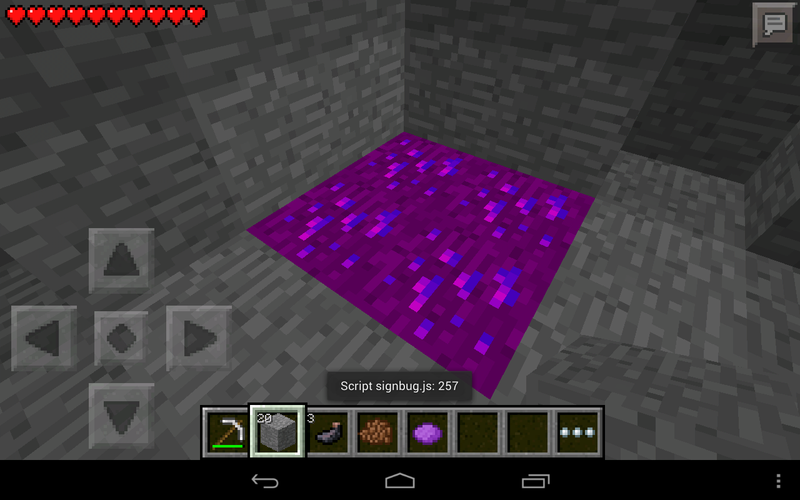 After overriding the breaking mechanic to drop purple dye, I now have purple ore of evil! Here's the script. It also uses item ID 187, so don't activate it with the previous script. - Custom blocks can overwrite existing blocks. - If you don't want your block to be placeable, use ModPE.setItem with the block's ID to override its item when held. - Render Types - Minecraft has special shapes for some blocks, such as crosses for flowers. I've added render type setup to the latest beta: go to https://github.com/Connor4898/ModPE-Scripts/wiki/Render-types for a list of block rendering types (scroll down). Whatz the snow texture id not the snow block the one found in snow biome onto of the dirt? I'm pretty sure the texture is number 66; however, my image had the red wool texture to make it look like carpet. I'm not smart enough for that: modding for iOS is much harder. Zhuowei can u add a block which makes you slow like cobwebs? I mean a render type of cobwebs maybe? Btw Good Job! This will enable a lot of mods. Block.defineBlock(SOUL_SAND_ID, "Soul Sand", what textures??? - Render Types - Minecraft has special shapes for some blocks, such as crosses for flowers. I've added render type setup to the latest beta: go to https://github.com/C...ki/Render-types for a list of block rendering types (scroll down). What if I dont disable the other scripts? So for the north, south, east, west thing; Does it work like this? In other words, is south towards you and north away from you? Or vice-virsa? Willing to work on Android apps or multi-platform games, see profile bio for information. Will you aallow us to texture the frame of the glass pane texture? Then we could make stuff like iron bars.